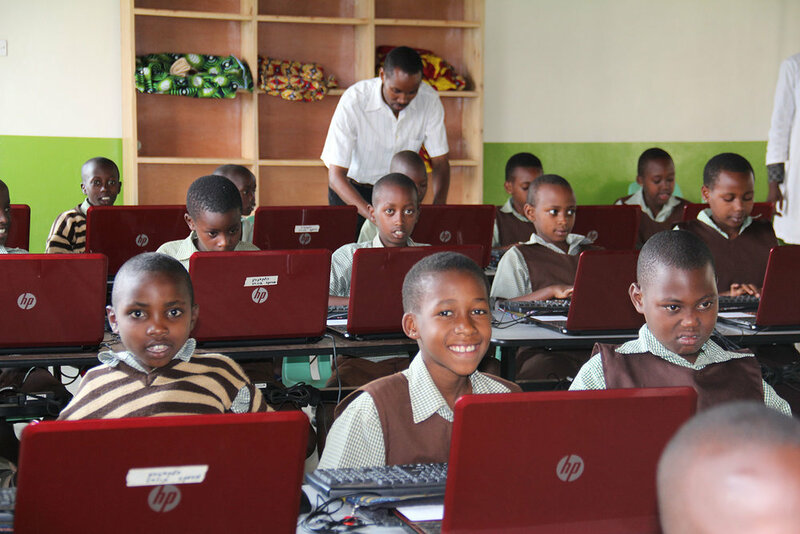 On eight acres just outside Kigali, Rwanda, Hope Haven School teaches 810 students from nursery to secondary levels. 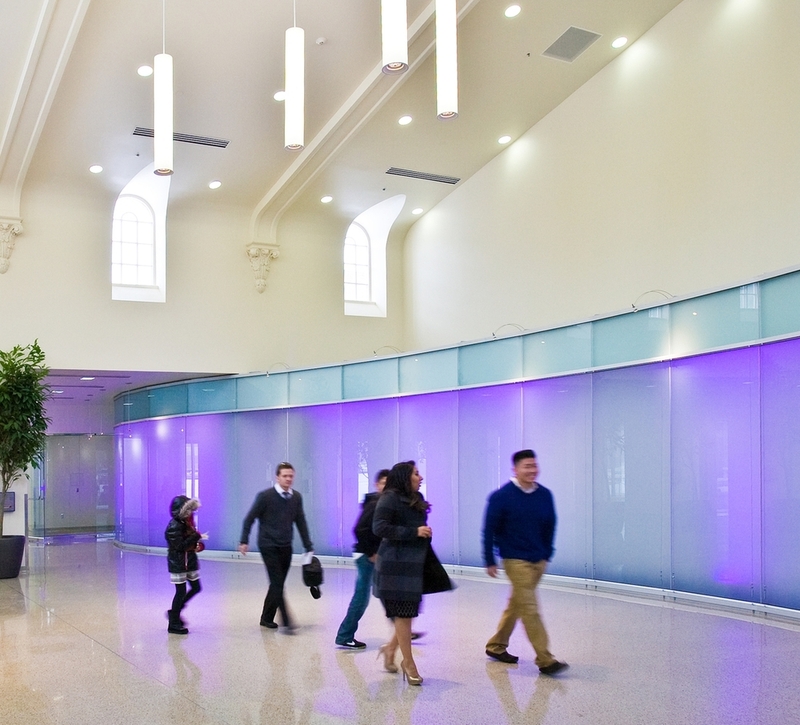 Now fully operational and considering expansion, the school designed by Libby Haslam and Jesse Allen in 2012, features a 38,000 square foot campus of classrooms, library, kitchen, dining and dormitories, and is unlike any of the other schools in Utah designed by GSBS architects. What it does have in common with other GSBS educational projects is the unique design in context with the schools' objectives, the environment and landscape. “Yes, there are universal educational goals, but we do not create 'cookie cutter' solutions to the schools we design,” says Allen. The firm's methods of working with administrators, faculty, the community, parents and students results in schools which are architecturally exciting and meet today's educational challenges. Schools in the Park City School District could look very different in a few years. Or, they might remain the same. It all depends on what the community decides. The district recently laid out a nine-month timeline and goals for a fresh master planning process, which include seeking recommendations from the Park City community to determine the direction of the district. By the end of spring, the district intends to have a master plan in place. The master planning process is kicking off with an open house on Monday. Park City residents will have the opportunity to voice their opinions at the event, which is scheduled to take place during two sessions, at 5:30 p.m. and 6:30 p.m. at the Sheldon Richins Building auditorium. Melinda Colton, spokesperson for the district, said officials plan to first ask how the community envisions the future of the district, then work backward to achieve that goal. "What is the future of learning going to look like, not just tomorrow, but 10 years down the road?" Colton said. "We are taking a step back to really make sure that education is driving our facilities, and not the other way around." District officials, including members of the Park City Board of Education, said they want to shift the focus from buildings and toward an educational vision for the district. The district is calling the master planning process "The Future of Learning." The Board recently came out with a statement indicating that the district has no current plans to seek a bond. Andrew Caplan, president of the Board, said the Board decided to publish the statement because he and others had heard several comments that Park City residents were not voting for the city's Treasure bond because the district would likely be asking for a bond in the near future. "There's likely to be an ask in terms of capital for building projects in the future, but we do not know what that looks like," Caplan said. The Board has considered bonding in the recent past, and even placed a $56 million bond measure on the ballot in 2015 that was voted down. Officials considered trying again in 2017 but ultimately scrapped the plan after data indicated there was likely not enough community support to pass a bond. The Board hopes to come at the master plan from a different angle this time around. "In this approach, we are coming from, 'What do we need in our educational environments to have our students match up with what we want a graduate to look like when they leave the system?'" said Todd Hauber, business administrator for the district and a member of the executive planning committee. The committee also includes Colton, Superintendent Jill Gildea, board member Anne Peters and director of buildings and grounds Todd Hansen. A steering committee, made up of 19 district employees, parents and community members, as well as the deputy county manager and a member of the Park City Council, will work directly with consultants, GSBS Architects, to determine options for a master plan to be presented to the Board in the spring. As a part of the planning process, the district intends to assess programs in the schools, including dual-language immersion, pre-school and coding, to determine how they will continue. Additional or specialized spaces and staffing might be required to continue to develop those programs, Hauber said. With a district focus on student well-being, the counseling centers at schools might look differently, too, he said. Victoria Bergsagel, education consultant with GSBS Architects, said once the district and community decide what they value, there will be a clearer road map to follow. The values — or guiding principles — will be discussed during a Future of Learning summit, which is set to take place on Tuesday. The steering committee and select teachers, students, district employees and community members are invited to attend. Bergsagel said they will build off the district's strategic plan, which the Board adopted last year. Once the guiding principles are determined, the steering committee will continue to have monthly workshops to discuss such topics as curriculum and the size of classrooms and other spaces in the schools and how they will be used. Colton said there will also be several community surveys throughout the process so the public can provide continuous feedback. A second open house is tentatively planned for Feb. 6. In the meantime, Clio Rayner, GSBS Architects project manager, will be working with her team to evaluate the current facilities and see if the kind of learning the community desires would fit in the spaces and which schools would need to be adjusted. Rayner said she and her team plan to present multiple options to the steering committee and, ultimately, the Board. They might include building new facilities or renovating the existing schools to fit the students' needs. GSBS Architects plans to provide the costs and logistics of each of the recommendations so the Board can decide on a master plan in May. "We like to focus on a very data-driven and flexible plan that allows for a lot of choice," Rayner said. District officials and those leading the master planning process have said they hope everyone can participate in some way. In a letter Gildea sent to all district employees on Monday, she said, "Educator voice is a key to ensuring that we are best prepared to meet the needs of our students. Your feedback throughout the process is valued, and we invite you to stay involved." Colton said the district plans to post all relevant documents, including the agenda, minutes and videos of the workshops, on its website. This is part of the district's goal to increase transparency throughout the process. Critics of the district in the past have said that it did not listen to the feedback from community members. Hauber said most feedback was likely taken into account during previous master and strategic planning efforts, but given that the discussions happened behind closed doors, the community was not aware. Community takes a look inside Woods Cross High School's remodel. Women In Architecture, Salt Lake Chapter, has named GSBS Architects Firm of the Year for the second time. WIASLC has a singular goal of gender parity in the field of architecture through three core strategies: Community, Mentoring, and Advocating., GSBS Architects was selected for excellence in creating a forward-thinking, flexible and employee-oriented work environment in firms with more than 20 employees. The firm first won the award in 2016. The criteria for judging were career development, flexibility, communication, benefits, diversity and inclusion, and firm amenities. Forty-eight percent of the GSBS staff is women, and are represented at every level from board member to the newest interns. Employees are from all over the world, including people from many U.S. States and eleven countries. The firm practices in five different disciplines – architecture, planning, landscape architecture, interior design, and economic consulting – are housed in an open-office environment, which encourages collaboration and knowledge sharing between disciplines. GSBS offers many career development opportunities for employees at every level. The firm also encourages mentorship through small “studios”designed to answer questions, give assistance, and provide personal advocacy. Diversity and inclusion in the workplace is a much discussed topic. At GSBS, it goes far beyond discussion. 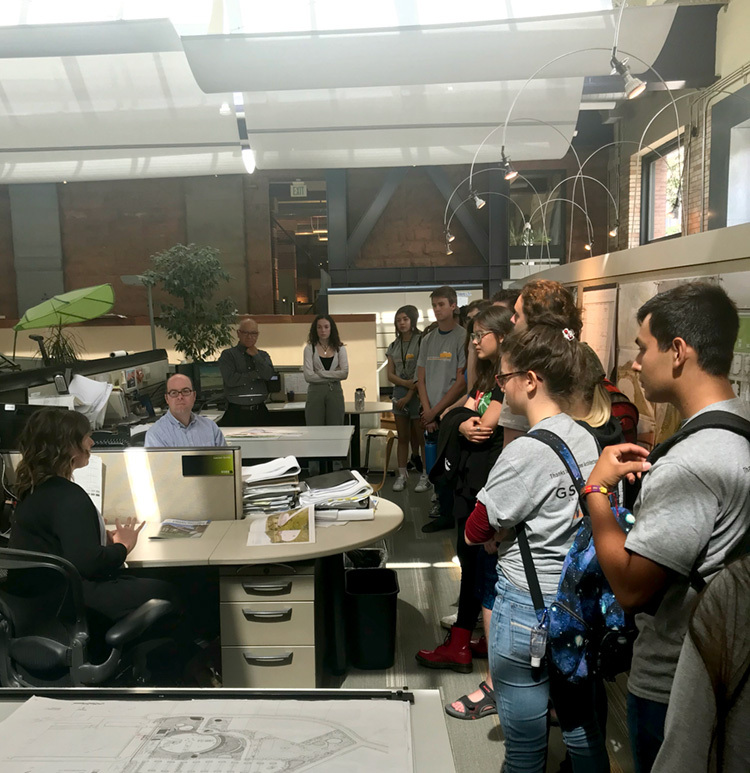 As part of the on-going commitment the firm has made, students in the University of Utah's “Discover Architecture' program visited the firm recently, as part of the firm's sponsorship. According to Mimi Locher, Chair of the School of Architecture, 19 students were enrolled this year, including 4 students from White Horse High School thanks to sponsors like GSBS Architects. “We understand that well-designed built environments play an integral role in the health and well-being of the people who inhabit them, and we endeavor not only to create buildings and experiences that enrich people’s lives but also to provide access to architecture education for students from diverse backgrounds who otherwise might not have the opportunity to learn about architecture and the value of well-designed environments. We in turn learn a great deal from these students – they teach us about their cultures and life experiences and help us understand new ways of being in the world,” Locher said. GSBS landscape architect David Garce says the U's program is designed to encourage students of color to consider architecture for a profession. “We have also been very active in reaching out to Native American populations, including Uintah River High School Seniors on the Ute reservation in Ft. Duchesne in May. Garce returned from Washington, D.C. at the end of June after participating in the American Society of Landscape Architects (ALSA) 2018 Diversity Summit. He was the first and only Native American (Catawba) in attendance among 14 participants, and 10 ASLA leaders, including national ASLA President Greg Miller. Garce said that the benchmarks prioritized from the 2017 Diversity Super Summit were reviewed, then, through an intense 3-day working session, explored strategies for developing resources that can assist implementing diversity, and inclusion practices into business practices. He noted that the support from GSBS Architects for his involvement with Utah High School students, student chapters of the American Indian Council of Architects and Engineers, Utah State University Landscape Architecture Department, and the University of Utah College of Architecture and Planning Diversity Program provided a relevant yet overlooked perspective to the Summit’s goals. GSBS and Latinos in Action at Woods Cross High School celebrated Earth Day by teaming up to build up-cycled planters with discarded building materials from the ongoing construction at the high school. 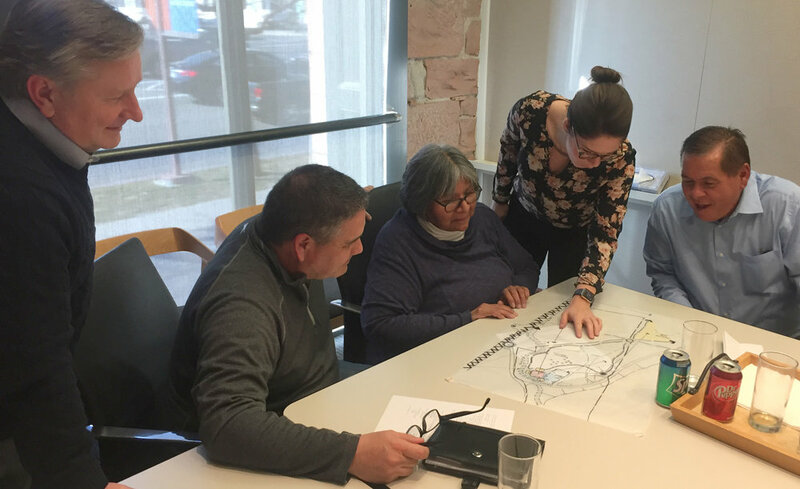 After three prominent members of the Northwestern Band of the Shoshone Nation met with a team of Salt Lake City architects to review designs for an interpretive center at the site of the Bear River Massacre, Michael Gross dreamed of his grandmother. Gross, a tribal councilman, said he woke up and immediately texted his cousin, Darren Parry, the chairman of the tribal council. “I think what we’re doing is the right thing,” he said, recalling the text message. In January, the tribe purchased 550 acres of land where an estimated 350 to 500 of their ancestors were massacred on Jan. 29, 1863, by federal troops led by Col. Patrick Connor. In the months since that land purchase, tribal leaders have been working with the USU College of Natural Resources to come up with a plan to restore the land to how it looked at the time of the massacre, including removing invasive plants and bringing back native species. Now, tribal leaders plan to build an interpretive center near the massacre site. Gross, Parry and Patty Timbimboo-Madsen, the tribe’s cultural resource manager, recently took a trip down to Salt Lake City meet with GSBS Architects. Before the meeting, Parry said he told the architects the tribe wasn’t looking for a big building sticking out in the middle of a cow pasture in Franklin County, Idaho. He said the tribe wanted something more subtle, with wood beams and large glass windows. As Gross recalls from that meeting, it didn’t take long for the three tribal leaders to choose their favorite design. “When they showed us a couple of designs that they had in mind, it was pretty unanimous pretty quickly,” Gross said. Baylee Lambourne, an architect with GSBS who worked collaboratively on the design with a few others, said she wanted to create a structure that was respectful to the Shoshone people and their strong connection to the land. A rendering of the design shows a humble structure sunk into the ground with a land bridge over top, filled with native grasses, with large outdoor plazas and an amphitheatre. Lambourne said the design team calls the building, “Reverence.” Gross and Parry both said they think the name is perfect. Parry said he wants the interpretive site to tell the whole story of his people. He is currently undertaking an informational tour of city council meetings throughout Cache Valley to share plans for the site, hoping that local leaders can then share that information with their residents. He said he wants to show that the tragedy didn’t define the tribe. But, Parry said, if the interpretive center is closed, visitors will still be able to learn the history from information on the outside of the building. David Garce, a principal at GSBS and a landscape architect, helped put together a larger site plan to do just that. Garce, himself a member of the Catawba Indian Nation who sits on board of directors of the American Indian Council of Architects and Engineers, said the site is peaceful and quiet with unobstructed views. As planned, the building will be a distance away from the actual massacre site. Walking trails would then meander around the field, leading to a recreated Shoshone encampment area with teepees. To show the scope of life lost in the massacre, Garce said the plan calls for placing 500 boulders throughout the field, each representing one life. “Once you see the immense number of lives-lost markers, it really makes an impact on you,” Garce said. Part of the mission of GSBS Architects, Garce explained, is to provide professional design help to underserved populations. He said they have worked with Paiute, Navajo, Hopi and Ute tribes. When the opportunity arose to work with the Northwestern Shoshone, they jumped on the project. He said most of the design work on the project is pro bono. The design might come cheap for the tribe, but the actual construction is another story. Parry said GSBS provided a cost estimate of $5 million. He is hoping to raise most of that from donations from Cache Valley residents and businesses. “I just have a feeling that this is such a beautiful story — it needs to be told — that I think there will be a lot of people that want to be involved with it,” Parry said. Gross said the fundraising effort will be a big task. He said he’s thought of putting on a benefit concert over the summer. With the land purchase and now the plans to build an interpretive center, he said it’s an exciting time for the Northwestern Band of the Shoshone Nation. “I feel like we’re honoring our ancestors by doing this,” Gross said.